At ANTlabs, we understand that excellent customer support forms an important part of our total product offering. We are committed to providing our customers with quality product, backed by prompt support to ensure that your experience with our product is both rewarding and problem free. We encourage our customers to register with us to enjoy the following benefits. To purchase software modules, license upgrades and support plans for IG 3100, visit Online Store or find a Reseller/Partner. To purchase our products, Contact Us or our Resellers/Partners. ANTlabs will provide telephone support for any Product covered by this T&C Document. Such support will consist of responding to trouble calls as reasonably required to make the Product perform as described in the current product specifications. Customer support will be provided in accordance with ANTlabs' support policies that are found in the document Product Support Policies and Procedures. Customer is entitled, at no charge, to software patches/updates of covered products, such as bug fixes and new releases that are generally made available at no additional cost to ANTlabs' customers that have a valid product software subscription for the relevant time period. The foregoing right shall not include any options, upgrades or future products which ANTlabs or third party vendors charge for as a separate product or where Customer’s installed hardware platform has no further upgrades available according to either (i) the applicable product release notes provided with each release or (ii) a written end-of-life announcement communicated to Customer by ANTlabs. ANTlabs is not obligated to provide hardware upgrades to ensure compatibility with new software versions of its products or to ensure that new software versions of its products are compatible with outdated hardware platforms. Under this option, the customer can report a faulty hardware unit to ANTlabs support. 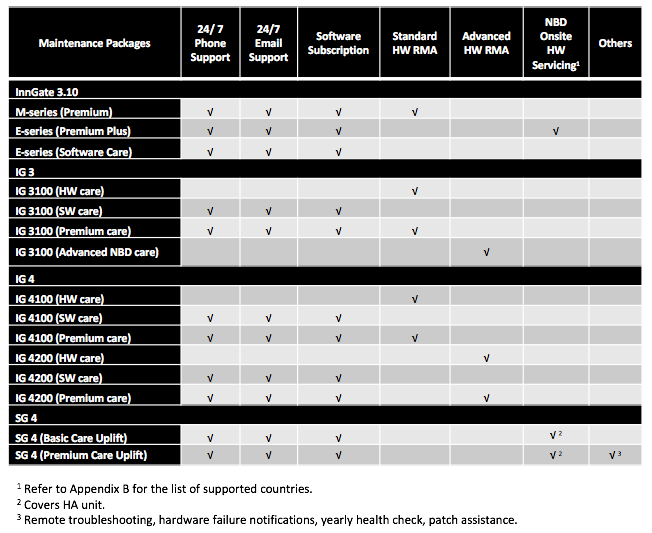 Upon confirmation of the hardware fault, the standard HW RMA process will trigger. A new replacement unit will be shipped out to the customer when ANTlabs receives the faulty unit. Customer is responsible for backing up, properly storing configuration files and implementation of those setting on the replacement hardware. The replacement system will be new or refurbished at the discretion of ANTlabs. This is an enhancement to Hardware RMA, which improves the turn-around time for the customer. Under this option, a new replacement unit is shipped out to the customer on the next business day (Singapore) after completion of troubleshooting when ANTlabs support accepts and logs a system hardware fault before 16:00 (Singapore Time) Monday to Friday. Customer is responsible for backing up, properly storing configuration files and implementation of those setting on the replacement hardware. The replacement system will be new or refurbished at the discretion of ANTlabs. RMA unit receives a thirty (30) day hardware warranty or the remainder of the original hardware warranty or active maintenance contract, whichever is longer. The faulty unit must be returned to ANTlabs authorized distributor within twenty (20) days. If not, the full purchase price will be charged to the customer. This is an advanced hardware replacement / servicing option whereby replacements parts and our support engineer are sent to customer site on the next business day upon confirmation of RMA. This support option can place a certified engineer at the customer’s location the following business day, after completion of troubleshooting when ANTlabs support accepts and logs a system hardware fault before 16:00 Monday to Friday, subject to parts availability. Service is performed on-site at the customer's location and is available Monday - Friday from 9:00 to 17:00 excluding normally observed local holidays. The End User information (customer name, address, contact number) must be present to activate this level of RMA. Refer to the ANTlabs Support Portal or Appendix A for a sample of the form. Incorrect or incomplete information about the End User will result in this service delivery and may affect the promised service level agreement. In addition, this level of RMA service is only applicable to products purchased in the specific supported countries and will not apply to parallel-imported units. For example, for a unit purchased in the US, onsite support can only be provided to an address in the US. Refer to ANTlabs Support Portal or Appendix B for the most current list of supported countries. 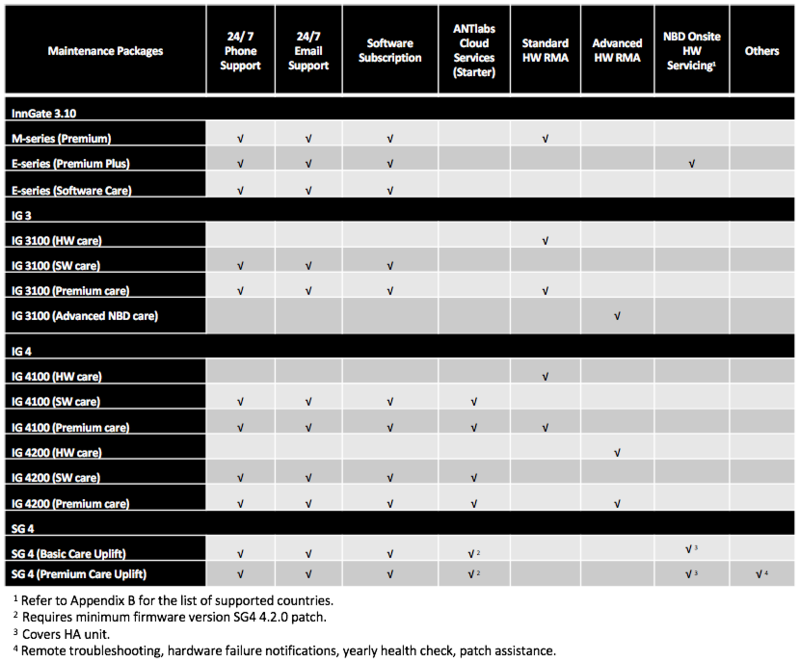 For countries not in the supported list, the support level will fall back to the Hardware RMA (replacement) option detailed above. All claims filed for hardware units that fail will be repaired at the discretion of ANTlabs. RMA parts / components receive a sixty (60) day hardware warranty or the remainder of the original hardware warranty or active maintenance contract, whichever is longer.